1. Ordnance Pamphlet 1719 describes procedures for operating Gun Fire Control System Mark 37. These procedures differ from the instructions for operating the different components of the system in the organization of the text according to tactical situations expected to be met with the fire control system. 2. The procedures described in Ordnance Pamphlet 1719 are not intended to establish doctrine for the operation of the Gun Fire Control System Mark 37. They are suggested procedures which embody principles incorporated by the design engineers and the results of experience in system operation. Where alternate procedures are suitable for different situations, these too are described. 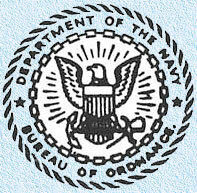 The Bureau welcomes additional suggested procedures and will revise Ordnance Pamphlet 1719 to keep the procedures current with changes in equipment design and/or tactical situations. 4. This publication is RESTRICTED and shall be safeguarded in accordance with the security provisions of U. S. Navy Regulations. It is forbidden to make extracts from or to copy this classified document without specific approval of the Chief of Naval Operations or originator, as applicable, except as provided for in article 9-10 of the United States Navy Security Manual for Classified Matter. OP 1060 Gun Director Mk 37. OP 1063 Stable Element Mk 6. OP 1064 Computer Mk 1. OP 1076 Radar Equipment Mk 12. OP 1153 Radar Equipment Mk 22. OP 1651 Radar Equipment Mk 25. In this pamphlet a chapter is devoted to each of these divisions. The chapters containing instructions for operation against air targets and surface targets are further subdivided according to the tactical situation; each giving the preferred methods of engaging visible targets (i.e., surprise attacks, daytime surface engagements, etc.) and obscured targets (i.e., night attacks, long range engagements, etc.). In certain methods are not for different tactical situations but are secondary methods of utilizing the equipment to cope with the same tactical problem. Where more than one method of operation for any tactical situation is given, the first method described is recommended if the operating conditions and the material condition of the equipments permit such a procedure. It is recognized, however, that in the use of certain ordnance equipment which requires human supervision, control, or operation, there are factors associated with the personalities of the available humans which, for a particular ship, may make most effective a procedure considered of secondary merit by other organizations. c. Obscured shore target with no suitable visible point of aim, but located in a known chart position. The procedures established herein are not gunnery doctrine. Cognizant commanders may find these procedures useful in formulating gunnery doctrines in that they may assist in defining the method of using the equipment which the doctrine prescribes for various tactical situations. Change of Range Receiver Mk 1. Computer Mk 1 or Computer Mk 1A. Radar Equipments Mk 12 and 22, or Mk 25 and Mk 32. 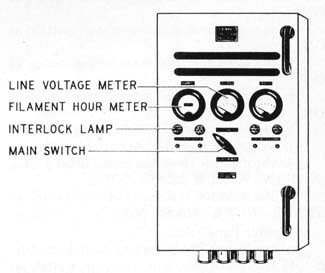 Range Spot Transmitter Mk 2. 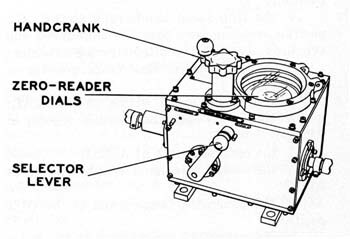 Searchlight Control Transmitter Mk 1. Slewing Sight Mk 2 or 4. Star Shell Computer Mk 1. 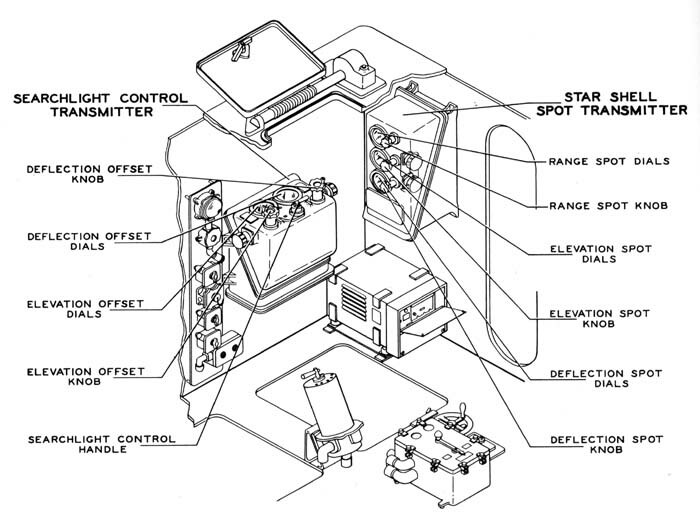 Star Shell Spot Transmitter Mk 1. Target Course Indicator Mk 1. 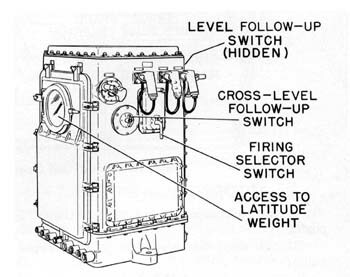 The standby condition of the Gun Fire Control System Mk 37 is its condition when targets are expected momentarily, but with no specific targets yet known. It is the materiel condition which permits engaging any type of target with minimum delay. It is apparent that the system must be thus ready for action both when fully manned (general quarters), and when the ship is in a reduced condition of readiness for action (condition watches), where there is a reduction in the personnel available to man the system. 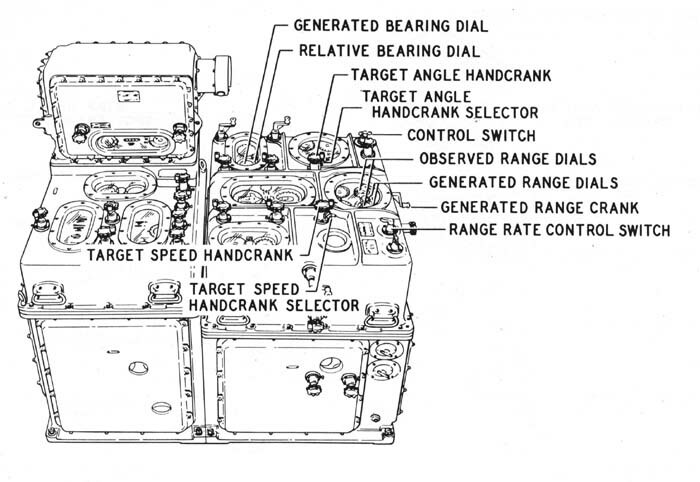 This chapter describes the steps necessary to place the Gun Fire Control System Mk 37 in the standby condition both with general quarters and condition watch crews. Throughout these instructions' where, depending on the number of personnel available, possible differences exist in the operation of the equipments, these differences will be noted. 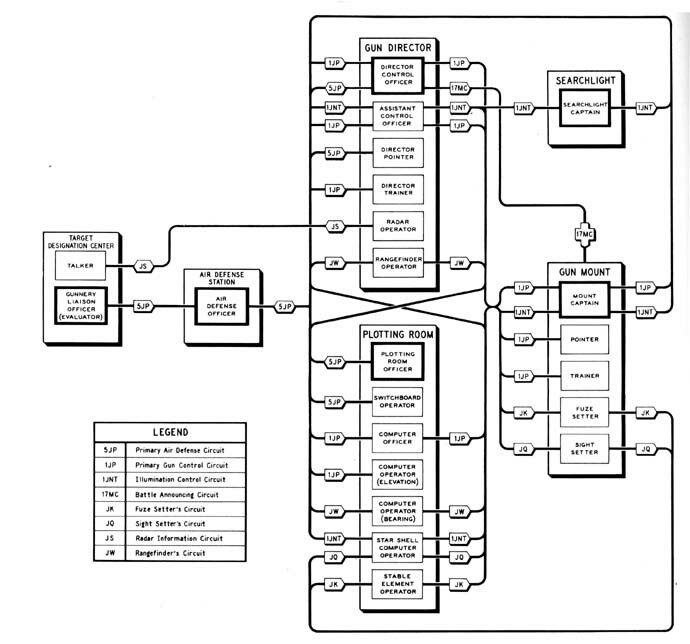 This section indicates the intercommunications that should be established among the components of the system and associated stations in order for operation to be effective. Two basic schemes are given. Certain variations within each are possible without decreasing effectiveness. Some of these variations are mentioned herein. Both schemes have had extensive use in war, and both are suitable for adaptation to the new developments in fire control installations (including target designation equipment) that are beginning to appear in various ship classes. Observe that the telephone circuit designations used in the two schemes do not conform to those in effect in certain ship classes; however, the selection of the suitable circuit in such cases should be straightforward, based on circuit interconnections and outlet arrangements. Scheme 1. 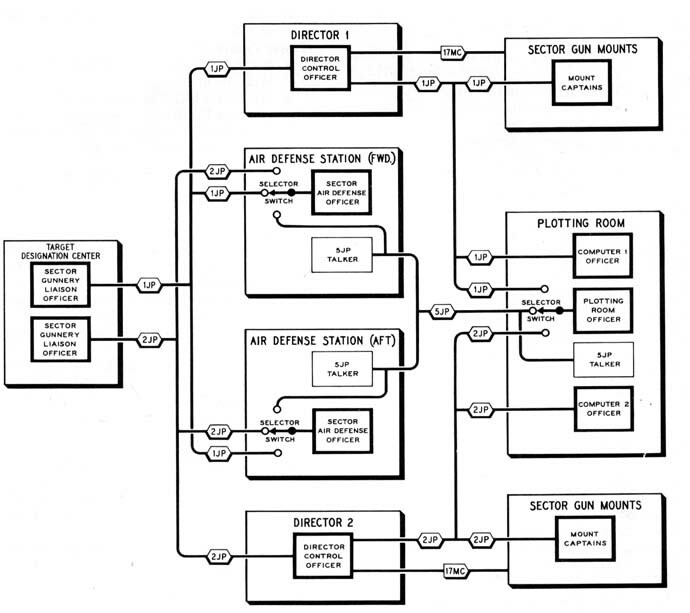 Figure 1 is a block diagram of a typical communications setup for a Gun Fire Control System Mk 37 in control of a portion of the ship's antiaircraft battery. Considerable fleet experience indicates that this setup is satisfactory. Its principal features are as follows. Figure I. 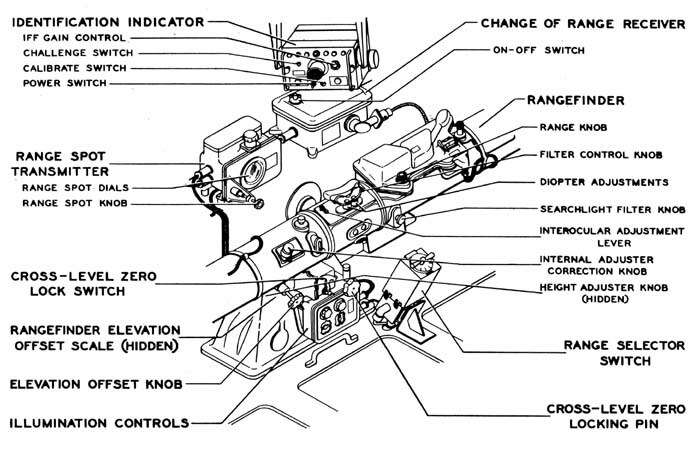 Typical Communications Setup—Gun Fire Control System Mk 37.
from being an auxiliary range transmission circuit, allows the rangefinder operator to give estimates of target angle to the computer operator (bearing). The radar information circuit (JS) is used for transmitting designation or identification data; this may or may not be found to be active. In any case, both the radar operator and rangefinder operator should receive the earliest target designations. Scheme 2. Scheme 2 is illustrated in figure 2. The principal basic variation in this scheme from scheme 1 requires changes in the organization at the air defense stations and in the target designation center. Sector designating officers in the target designation center and sector air defense officers in the topside air defense station (s) replace the indicated single gunnery liaison officer and single air defense officer. By providing key personnel with selector switches, this system provides an efficient method for giving each sector a sufficient number of channels for communication with the control and designation centers. Figure 2. Primary Control Circuits on a Two-System Ship. The following circuits should be energized at the IC Switchboard. All of these circuits do not appear on all ships, and in some installations certain of these circuits are paralleled; however, to make this procedure applicable to all installations, all of the circuits that should be energized are listed here. GSL 115 V AC power supply. 24GS 6 V DC supply. 42GS Star shell train order. 43GS Star shell elevation order. 53GS Star shell fuze order. 62GS Star shell deflection spot. 63GS Star shell elevation spot. 73GS Star shell range spot. a. Set the Radar Equipment Mk 12 line switch at ON. b. Set the Radar Equipment Mk 22 line switch at ON. a. Set the STANDBY switch at ON. c. Set the OPERATE switch at ON. a. Turn the DC voltage control until the DC output voltage meter reads 5.2.
a. Set the REMOTE-LOCAL switch at REMOTE. a. Momentarily press the OFF push button. b. Check that the BATTLE SHORT lamp is extinguished. a. Set the power switch at OFF. b. Set the LOCAL-REMOTE switch at REMOTE. a. Set the main switch at OFF. b. Inside the Control Unit (Power), set the range unit oven toggle switch at ON and the emergency power switch at OFF. a. Set the power switch at ON. 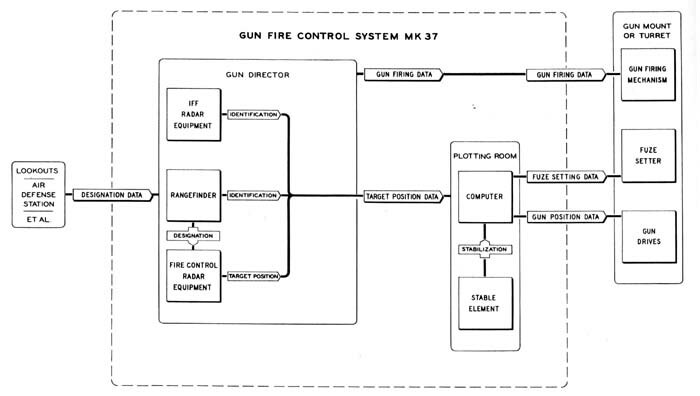 Since several different types and modifications of fire control switchboards are furnished with Gun Fire Control Systems Mk 37, these operating instructions are necessarily general. The location of certain switches varies from board to board, hence no attempt will be made to show the location of the switches. Instead, they will be designated by their functions. In any particular installation, specific switches thus referred to should be easily identifiable by their label plates. i. the gun mount firing and battle announcing rotary switch at 17MC and 2PA. k. the director train transmitter switch at TRANS. NO. 1 & TRANS. NO. 2.
q. the gun elevation order transmitter switch at NO. 1 IND. & NO. 2 AUTO, or NO. 1 AUTO. & NO. 2 IND. b. the own ship course and own ship speed receiver switch at O.S.C. & O.S.S. f. the sight setter's indicator switch at ON. a. Set the mercury control switch at ON. b. Set the motor generator selector switch at the position corresponding to the generator that is to be used. c. Set the follow-up system switch at FILAMENTS AND LIGHTS ONLY. Figure 7. Stable Element Control Panel. e. After the gyro is up to speed, set the follow-up system switch at ON. f. Then set the mercury control switch at AUTO. a. Set the latitude weight at the position corresponding to the ship's latitude. b. Set the firing selector switch at CONTINUOUS FIRE. c. Set the level follow-up switch at AUTO. d. Set the cross-level follow-up switch at AUTO. a. Set the selector lever at CONNECT AND SYNCHRONIZE. b. Turn the hand crank until the zero reader dials are matched at the fixed index. c. Set the selector lever at LOCK. The following operations are those required to place the computer in the standby condition. Figure 8. Stable Element Mk 6. Figure 9. Selector Drive Mk I. Figure 10. 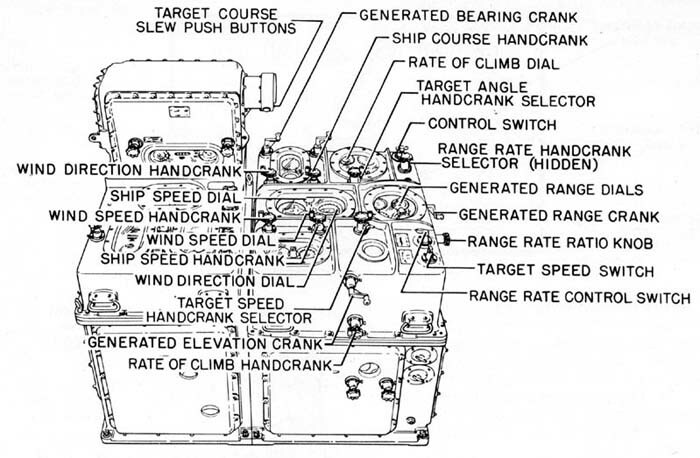 Control Unit Operating Controls—Computer Mk I.
r. the rate of climb hand crank at the OUT (or AUTO) position. s. By means of the target course slew push buttons and the target speed switch, slew target angle and target speed to the values established by doctrine according to the type of target expected. t. If Ordalt 2331 has been accomplished, set the AIR-SURFACE selector (fig. 28) at AIR. Figure 11. 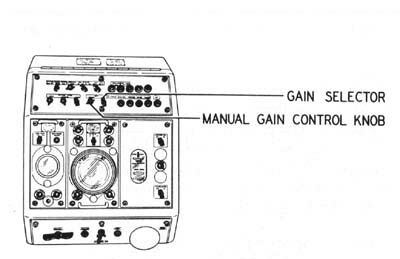 Computer and Indicator Unit Operating Controls—Computer Mk I.
k. the star shell range spot dial at zero. a'. In amplidyne-control directors, set the main disconnect switch at ON. b. Set the train parallax selector (if any) at AUTO. c. Set the elevation parallax selector (if any) at AUTO. The steps outlined in this section assume that the radar equipments are being placed into operation from a cold start. Further, it is assumed that the radar room operations outlined in section 2.2 have been performed. Radar Equipments Mk 12 and Mk 22 (fig. 12). a. At the operator's control unit, set the pilot lamps switch at ON, the meter lamp switch at ON, and the power switch at ON. b. The pilot lamp just above the power switch should light, indicating that the filament transformers are energized. After about 1.5 minutes, the center pilot lamp should light, indicating that the time-delay relay has closed and that all door switches are properly closed. Do not proceed to the next step until the center pilot lamp is lighted. c. At the operator's control unit, set the STANDBY-OPERATE switch at OPERATE. d. At the indicator unit, set the selector switch at RANGE. Mk 12 and Mk 22). g. At the operator's control unit, set the receiver sensitivity switch at AUTO. There should be approximately one-eighth inch of grass on the indicator unit screen. h. At the transmitter-receiver unit, adjust the receiver tuning control to give maximum signal. (To do this, bring a target pip* into the notch by means of the range hand crank on the range unit; set the receiver sensitivity switch at MAN to avoid saturation of pips while tuning; remove the cap protecting the receiver tuning control; and make the required adjustment.) Adjust the T-R tuning control for maximum signal. i. At the indicator unit, check the zero setting as follows: The receiver sensitivity switch at the operator's control unit should be at MAN and the adjacent gain control should be adjusted until the height of the transmitted pulse is approximately one-half inch. Center the transmitted pulse in the notch and check that the range reading is within 10 yards of the zero-setting range. j. Set the receiver sensitivity switch at AUTO. k. At the range unit, set the range dials according to doctrine for the operating conditions and most probable target. a. Check to see that the Radar Equipment Mk 12 is in complete operation. Be sure that the set is pulsing. ATTEMPTING TO OPERATE RADAR EQUIPMENT MK 22 WITHOUT HAVING THE MAIN RADAR EQUIPMENT (MK 12) IN FULL OPERATION WILL RESULT IN SERIOUS DAMAGE TO THE MK 22.
b. At the amplifier power assembly, depress the ON button of the 400-cycle power switch. The indicating lamp above the 400-cycle power switch, as well as the meter lamps, should light. The dimmer control adjusts the intensity of these lamps. c. Check to see that the pointer turns the intensity control on his indicator unit (fig.14) counterclockwise to reduce the spot intensity and prevent damage to the screen. (1) Make sure that the two blowers in the amplifier-power assembly are operating. (3) Place the test meter switch at REG RECT+VX100 position. Regulated rectifier voltage should be between 290 and 310 volts. e. Check again to be sure that the transmitter of the main radar is operating. At least 1 minute must elapse between the time the 400-cycle power switch is depressed and step (f). f. Press the OPERATE button of the transmitter switch. g. Observe the magnetron current on the test meter (test meter switch at the MAG MA X 5 position). Magnetron current should be between 2.7 and 3.3 milliamperes. The pilot lamp above the transmitter switch should light. h. Check to make sure that the 400-cycle voltage meter reads 115 volts. i. Set the indication switch at the MAN position. Mk 22 performance can now be checked on the main radar's range oscilloscope. j. Reduce the receiver gain of the main radar so that only Mk 22 signals appear on the oscilloscope screen. On main radars with automatic gain control, the receiver sensitivity switch should be placed on the MAN position for this adjustment. k. Point the antenna toward a fixed target if one is available. Otherwise, use the strongest moving target available. If no target is available, use the transmitted pulse in making the next adjustment. 1. 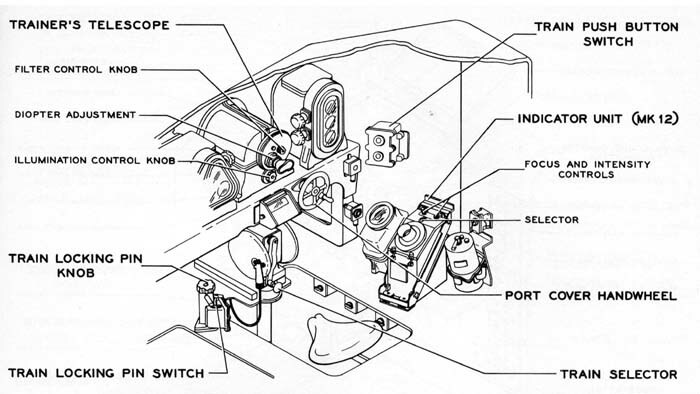 Adjust the REG GAIN control on the indicator unit (fig. 14) until the target echo signal can be seen clearly. It must be kept below saturation at all times. *If a target is not available, the tuning adjustment may be made by using the test unit of Radar Equipment Mk 12. Figure 13. Radar Operator's Station—Gun Director Mk 37 (Equipped with Radar Equipment Mk 25). reference. This setting should be maintained when automatic frequency control is used because of the interaction between the two circuits. n. Set the receiver tune switch at AFC. If the repeller voltage is different from the value recorded in step (m), adjust the receiver tune adjustment control to make the voltage equal the recorded value. o. Set the antenna drive switch at ON. Check to see that the antenna oscillates. p. Set the REG GAIN control (fig. 14) at REMOTE, and the indication switch (fig. 12) at NORM. a. At the radar transmitter-receiver, set the wave guide switch handle at the UNLOCKED position and the RADAR-COMM toggle switch at RADAR. (1) Set the wave guide selector at ANTENNA ONLY. (2) Set the MOD SELECTOR switch at LOG. (3) Set the ANTIJAM selector at OFF. (4) Set the RECEIVER CONTROL selector at AFC. (5) Set the GAIN selector at AGC. (6) Set the COMPUTER AID switch at ON. c. If one-man (trainer) control is desired, set the TRAINER CONTROL switch of the radar console at ON. (1) Press the OPERATE push button. The OPERATE lamp should light after about 3 minutes. (2)Set the VIDEO SELECT switch at OPR. (3) Set the SWEEP selector at PRES. (4) Adjust the Radar Indicator Mk 21 DIMMER control until the horizontal and vertical indexes on the indicator are easily visible. (5) Set the DISPLAY selector at B. (6) Push the HORIZ CENTER knob and adjust it so that the range sweep is coincident with the vertical index. (7) Set the DISPLAY selector at E.
(8) Push the VERT CENTER knob and adjust it so that the range sweep is coincident with the horizontal index. (9) Set the SWEEP selector at MAIN. MAIN RANGE POSITION knob so that the start of the sweep is one-fourth inch from the left edge of the indicator screen. 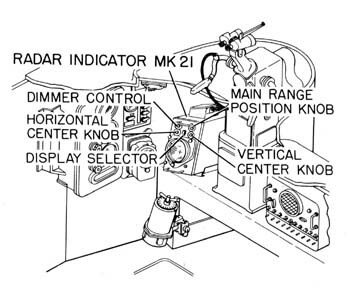 (11) Adjust the Radar Indicator Mk 21 MAIN RANGE POSITION knob so that the sweep starts one-fourth inch from the left edge of the indicator screen. (12) Adjust the DIMMER control until the range dials and designated range indicators are visible. doctrine to suit the operating conditions, possible target, etc. (14) The READY light on the indicator display should be extinguished. If not, extinguish the light by stepping on the radar operator's automatic-manual transfer foot switch. a. Turn the port cover handwheel to open the cover over the pointer's telescope. b. Set the elevation selector lever at LOCAL. c. Press the ON push button. d. Set the elevation selector lever at AUTO. e. Adjust the telescope filter control knob and illumination control knob to suit the operating conditions. f. Set the telescope diopter adjustment to suit the pointer. 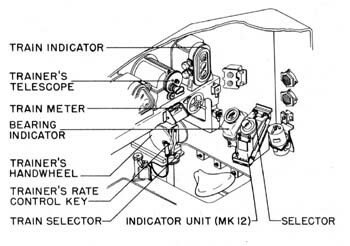 (1) Set the indicator unit (Radar Equipment Mk 12) selector at ELEV. (2) Adjust the focus and intensity controls to give a clear, sharply denned trace. (3) Check that the antenna of Radar Equipment Mk 22 is oscillating. (4) At the indicator unit (Radar Equipment Mk 22) : turn the REC-GAIN control fully counterclockwise. Adjust the intensity control until a vertically moving spot is just perceptible. Adjust the SWP-AMP control, if necessary, so that the sweep moves between the top and bottom of the screen. Center the screen presentation horizontally by adjusting the H-CNTR control. Turn the REC-GAIN control clockwise until the spot intensity is increased to a point where a dim vertical line is continuously visible over the entire height of the screen. Figure 15. Pointer's and Trainer's Station—Gun Director Mk 37 (Equipped with Radar Equipment Mk 25). (1) Adjust the DIMMER controls until the indexes on both screens are visible. (2) Have the radar operator (or trainer) set the SWEEP selector at PRES. (3) Set the DISPLAY selectors at E.
ident with the horizontal indexes on both indicators. (5) Set the DISPLAY selectors at B. (6) Push the HORIZ CENTER knobs and adjust them so that the range sweep on both indicators are coincident with the vertical indexes. (7) Have the radar operator (or trainer) set the SWEEP selector at MAIN. (8) Adjust the MAIN RANGE POSITION knobs until both range sweeps start one-fourth inch above the bottom edges of the indicator screens. (9) Set the Radar Indicator Mk 22 DISPLAY selector at AE. (10) Extinguish the READY lights on both indicators by operating the trainer's and pointer's automatic-manual foot switches (Transfer Switch Mk 13). a. Turn the port cover handwheel to open the cover over the trainer's telescope. b. Withdraw the train locking pin by turning the knob counterclockwise until the limit is reached. c. Set the train locking pin switch at ON. d. In Arma-control directors, set the train selector at LOCAL. d'. In amplidyne-control directors, set the train selector at MANUAL. e. Press the train ON push button. f. Set the train selector at AUTO. g. Adjust the telescope filter control knob and illumination control knob to suit operating conditions. h. Set the telescope diopter adjustment to suit the trainer. Figure 16. Trainer's Station—Gun Director Mk 37 (Equipped with Radar Equipment Mk 12). (1) Set the indicator unit (Radar Equipment Mk 12) selector at TRAIN. (1) Set the antenna scan selector at AUTO. (2) IF ONE-MAN CONTROL IS DESIRED, press the OPERATE push button; set the SWEEP selector at MAIN; and by means of the range SLEW lever, set range at the value prescribed by the ship's doctrine to suit operating conditions, possible targets, etc. a. Set the power transfer switch at NOR. b. Withdraw the cross-level zero locking pin (fig. 18). c. Lift the cross-level reset handwheel to disengage it from the cross-level gearing. d. Set the cross-level reset switch at ON. (1) Set the cross-level zero lock switch at ON (fig. 18). (2) Press the cross-level ON push button. (2) Set the cross-level zero lock switch at ON (fig. 18). f. Set the star shell range spot dials at zero. g. Set the star shell elevation spot dials at zero. h. Set the star shell deflection spot dial at zero. i. Set the searchlight control handle at OFF-CLOSE. j. Set the searchlight elevation offset dial at zero. k. Set the searchlight deflection offset dial at zero. 1. Open the overhead hatch cover if desirable. m. Set the target designation selector switch (if any) for the desired target designation center. n. At the Identification Indicator (fig. 18), set the challenge switch at OFF; the IFF gain control knob at the extreme counterclockwise position; the calibrate switch at OFF; and the power switch at OFF. Figure 17. Assistant Control Officer's Station—Gun Director Mk 37.
o. At the BN-1 (or BN) unit, set the gating switch at OFF; the keyer switch at ON; and the power switch at ON. p. At the Identification Indicator (fig. 18) set the power switch at ON. q. Set the IFF challenge switch (fig. 18) according to doctrine and operating conditions. a. Set the change of range receiver switch at ON. b. Set the range spot dials at zero. c. Set the range selector switch at RADAR & AR to R.F. d. Set the rangefinder elevation offset scale at zero. e. Remove the protective caps from the ends of the rangefinder. g. Adjust the illumination controls, the filter control knob, and the searchlight filter knob to suit operating conditions. h. By means of the range knob, set range at the stand-by value as prescribed by doctrine. a. On amplidyne-control directors, set the slewing sight train securing pin and the elevation selector at SLEW. a'. On Arma-control directors, unlock the slewing sight. Figure 18. Rangefinder Operator's Station—Gun Director Mk 37. Figure 19. Control Officer's Station—Gun Director Mk 37 (Equipped with Radar Equipment Mk 12). b. Press the slewing key. c. Slew to the stand-by position as determined by the ship's doctrine. d. Set the interocular and diopter adjustments of the binocular to suit the control officer. e. Set the elevation spot dials at zero. f. Set the deflection spot dials at zero. g. Set the battle telephone selector switch at 5JP (air defense circuit). 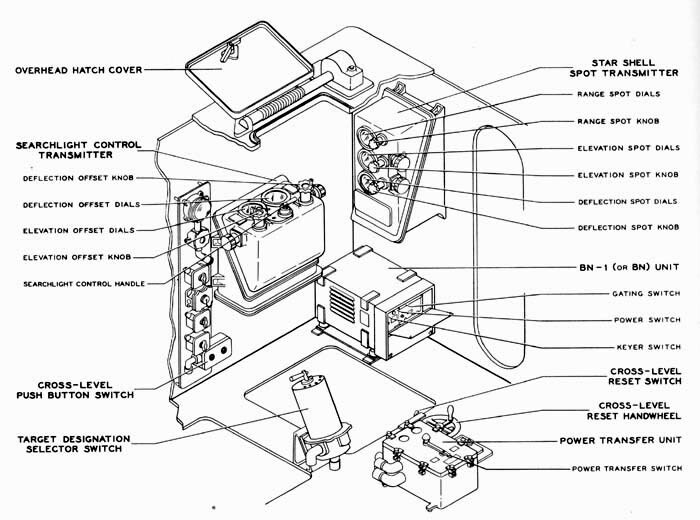 (1) Set the indicator unit selector (Radar Equipment Mk 12) at SPOT. (1) Set the DIMMER control so that the horizontal and vertical indicator screen indexes are visible. Have the radar operator (or trainer) set the SWEEP selector at PRES. (2) Set the DISPLAY selector at E.
(3) Push the VERT CENTER knob and adjust it so that the range sweep coincides with the horizontal index. (4) Set the DISPLAY selector at B. (5) Push the HORIZ CENTER knob and adjust it so that the range sweep coincides with the vertical index. (6) Have the radar operator (or trainer) set the SWEEP selector at MAIN. (7) Adjust the MAIN RANGE POSITION knob so that the sweep starts one-fourth inch above the lower edge of the indicator screen. a. Set the controller line switches, located at the train and elevation power motor controllers, at ON. a. Set all selector switches at the position which permits control by the Gun Fire Control System Mk 37.
a. Start the train drive power motor. b. Set the selector at AUTO. c. Set the parallax selector (if any) at AUTO. a. Start the elevation drive power motor. a. Start the fuze setter. 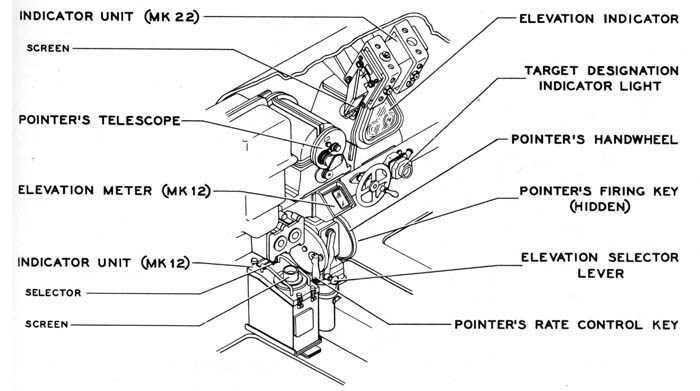 The operations outlined in sections 2.1 to 2.5 place the Gun Fire Control System Mk 37 in the stand-by condition. This section briefly summarizes the status of the gun director and the plotting room equipments when in the stand-by condition. Gun director. The gun director is completely energized. Cross level and the parallax corrections are being received automatically. The computer aid circuits are so connected that the generated quantities will be received from the computer at the train and elevation drives, the range finder, and the radar range unit. The radar equipment is energized and radiating so that it may be utilized as search equipment during the stand-by period. Only a few switching operations are required in shifting to the tracking phase; no waiting period is necessary. The gun director complement consists of six men when fully manned. When equipped with Radar Equipment Mk 25 Mod 2, the gun director may be placed in the stand-by condition with only one operator, the director trainer. Plotting room. 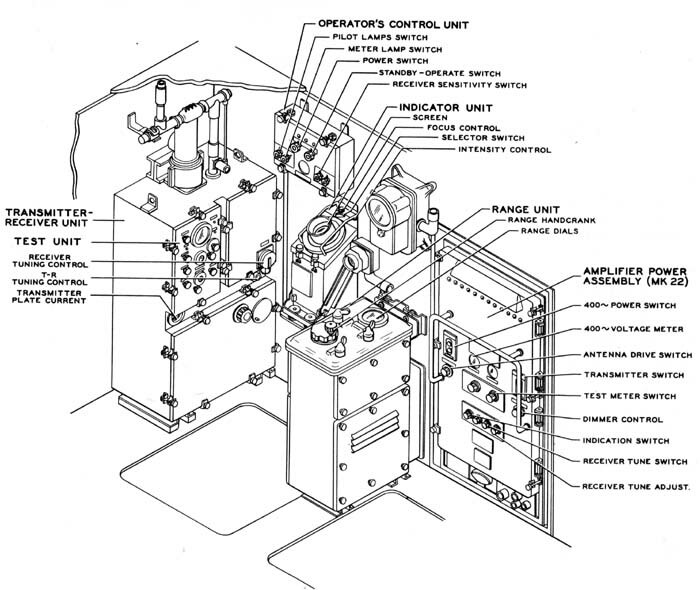 The stable element is energized and in automatic control, continuously transmitting level and cross level to the computer, cross level to the gun director, and level to the searchlights (in certain installations only). Except for the time motor, the computer is completely energized and in automatic control. The sensitivity of Computers Mk 1A is at its maximum value. To commence tracking it is only necessary to introduce estimated values of target speed and target course (or target angle), and energize the time motor. 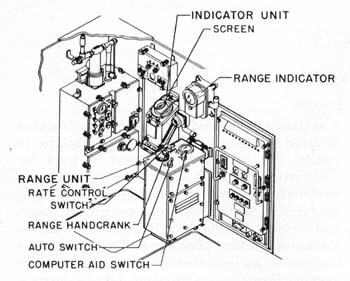 In addition to transmitting parallax, fuze setting, and gun orders, the computer is set up for transmitting generated quantities to the gun director to aid in the tracking problem. Figure 21. Operation of Gun Fire Control System Mk 37 (Equipped with Radar Equipment Mk 12) Against Visible Air Targets. Figure 22. Control Officer's Station—Gun Director Mk 37 (Equipped with Radar Equipment Mk 12). Gun Fire Control System Mk 37 is designed primarily for use against air targets, both visible and obscured. Since the procedures to be followed for engaging these two types of air target differ in several respects, they will be discussed separately. The instructions assume that the equipments have been placed in the stand-by condition as described in chapter 2. The problem of engaging a target can be divided into three phases: (1) target acquisition, (2) tracking, and (3) firing. The first phase, target acquisition, commences when a target is designated to the director. It ends when the target is centered in the director scopes and the director control officer informs plot that the gun director is "ON TARGET." The second phase, tracking, is the time that the director stays "ON TARGET." The fire control problem is solved during this phase. The third phase, firing, is started by the "COMMENCE FIRING" order and ended by the "CEASE FIRING" order. Operations of the tracking phase are continued during this phase. This section outlines the method of engaging visible air targets for systems equipped with Radar Equipment Mk 12. The procedure for systems equipped with Radar Equipment Mk 25 is given in section 3.3. Since most air targets that are visible at the time of initiating action against them are undesirably close, the quickest and most direct method of engaging them must be employed. 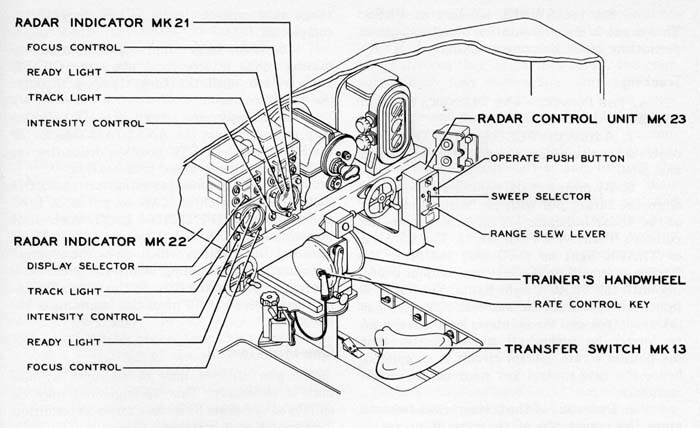 Figure 21 indicates the over-all function of the major units of the Gun Fire Control System Mk 37 when it is equipped with Radar Equipment Mk 12 and employed against a visible air target. The most effective method of operating a system so equipped, utilizes optical tracking in train and elevation, and radar tracking in range. The optical range finder is used for designation and identification purposes, serving to designate the proper target pip to the radar operator by giving him an approximate range, and helping in the identification problem by visual recognition when the IFF response is not conclusive. As indicated by figure 21, the stable element furnishes stabilization data to the computer. From the target position data, received from the gun director, and the stabilization data, the computer determines the required fuze setting and gun position data. Firing of the guns is controlled from the gun director. A detailed outline of the target acquisition, tracking, and firing operations follows. On a well-organized and trained ship, the air defense station should play an active part in target acquisition by designating visible targets. Information as to the target's position and other characteristics should be relayed to the proper gun director. Since the range of a visible target is probably short, target acquisition must be accomplished by the most direct method in order to allow sufficient time to engage the target before the target accomplishes its mission. a. Press the slewing key and offset the slewing sight in the direction of the target. This causes the gun director to slew toward the target. a. Turn the range hand crank until the target pip at the range designated by the range finder operator is in the notch of the indicator unit screen. This positions the range transmitters at the correct range, which is transmitted to the plotting room. b. Set the auto and computer aid switches at ON. The auto switch automatically keeps the target pip gated, while the computer aid switch energizes the radar change of range receiver and permits increments of range from the computer to assist in keeping the target pip gated. c. Hold the rate-control switch at ON whenever the target pip is in the notch. This completes circuits which permit the radar equipment to correct the computer's solution if it is in error. a. Set the identification indicator (fig. 24) challenge switch at ON. b. Observe the screen of the identification indicator, and inform the control officer whether the target being tracked is a "friendly" or a "bogey." a. Assist with the recognition problem by viewing the target through the range finder. b. Check range to see that the radar operator has the correct pip in the notch. Figure 24. Rangefinder Operator's Station—Gun Director Mk 37. Tracking commences when the director control officer gives the word "ON TARGET" and continues until the target is destroyed or passes out of range. During this period the following operations should be performed. a. After the slewing sight has been held on the target for a few seconds with the rate control key closed in order to establish approximately correct rates at the computer, release the rate control key and the slewing key, thereby transferring control of the gun director to the pointer and trainer. Figure 25. Pointer's Station—Gun Director Mk 37 (Equipped with Radar Equipments Mk 12 and Mk 22). a. Turn the pointer's handwheels until the horizontal cross hair of the pointer's telescope is on the target. If necessary, continue turning the handwheels to keep the horizontal cross hair on the target as much of the time as possible. a. Turn the trainer's handwheels until the vertical cross hair of the trainer's telescope is on the target. If necessary, continue turning the handwheels to keep the vertical cross hair on the target as much of the time as possible. b. Whenever the vertical cross hair is on the target, press the trainer's rate control key. a. Keep the target pip in the notch of the indicator unit screen. b. Hold the rate control switch ON whenever the target pip is in the notch. Figure 26. Trainer's Station — Gun Director Mk 37 (Equipped with Radar Equipment Mk 12). Figure 27. 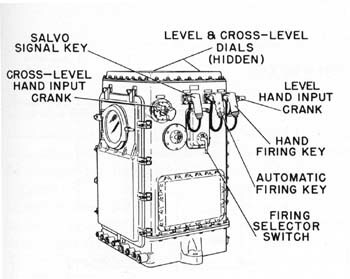 Operating Controls—Computer Mk I.
a. Observe the target through the range finder and give the plotting room estimates of target angle. b. Continue to assist with the designation and identification problem if necessary. c. Range on the target so that a stand-by range is available in case the radar equipment loses the target. a. By means of the target course slew buttons, slew target angle to the value estimated at the gun director or air defense station. b. When the director control officer gives the word "ON TARGET," set the time motor switch at ON. speed and target angle to oscillate. This gives a minimum range solution time constant without causing instability. Time constants are discussed in more detail in the Evaluation of Method part of this section. (1) Set the range time constant knob at 2 seconds. (2) If the target maneuvers radically (i.e., the solution indicators spin), momentarily depress the sensitivity push button. This increases the computer sensitivity as explained later in this section. a. Close and lock the pointer's firing key. Figure 28. 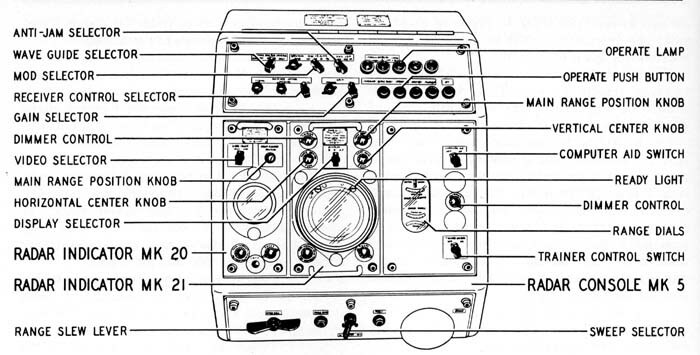 Additional Operating Controls—Computer Mk IA (After Ordalt 2331 A). should be performed in addition to those outlined for tracking. Gun Director. b. 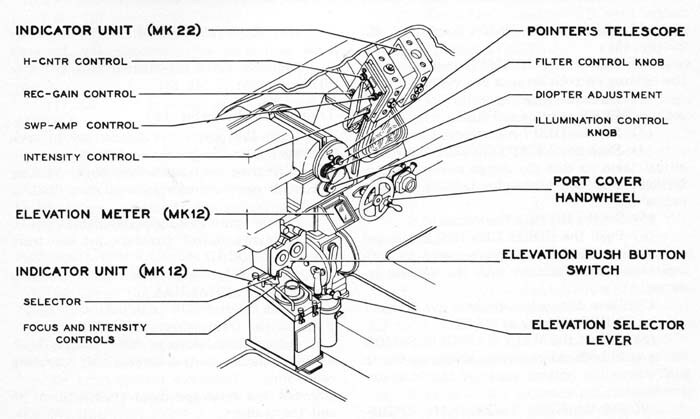 The system permits application of spot to elevation and deflection by means of the elevation and deflection spot knobs; however, the best spotting doctrine for the Gun Fire Control System Mk 37 against visible air targets is "DO NOT SPOT." c. Give the "CEASE FIRING" order by closing the cease firing contact maker or over the 17MC or gun control circuit (UP), whichever is preferred. a. When the "COMMENCE FIRING" order is given, close the pointer's firing key. Since the gun pointer's firing key already is closed, this completes the gun firing circuit. b. When the "CEASE FIRING" signal is sounded, open the pointer's firing key. The entire system should then be returned to the stand-by condition as outlined in chapter 2. Any method which requires tracking and rate controlling with the slewing sight will not give smooth enough target position data for the system to obtain a stable solution. However, tracking for a. period equal to one or two time constants with the slewing sight rate control key depressed will reduce any error in the original target setup by 65 to 85 percent. This is enough to ease considerably the task of the pointer and trainer in getting "ON TARGET," and permits opening fire almost immediately thereafter. Figure 29. 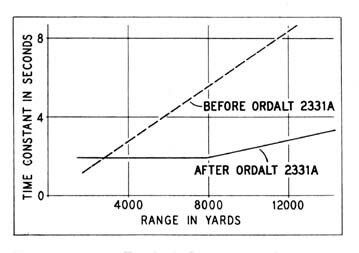 Time Constants for Air Targets—(Before and After Ordalt 2331 A). Figure 30. Effect of Sensitivity Push Button on Time Constant. ties in tracking cause oscillations in the solution and result in an extremely large, undesirable dispersion. These conditions can be improved somewhat if operators remember that before Ordalt 2331A, no matter what the range, a given angular correction at the director (i.e., rotation of pointer's and trainer's handwheels) will cause a given rate correction. Keeping this in mind, the pointer and trainer will find that at long ranges the system is less sensitive because a given change in the target's rate will require less of an angular correction. The pointer and trainer may compensate for this characteristic at long ranges by letting their line of sight go slightly off the target, closing their rate control keys, and bringing it back on. Here again, practice and a "feel" of the system is a major item in obtaining proficiency. After Ordalt 2331A, the best thing for the pointer and trainer to do is to stay ON TARGET and keep their rate control keys closed. After Ordalt 2331A, the computer operator may control the system time constant by means of the sensitivity push button (fig. 28). Time constants for a typical problem are illustrated in figure 30. Assume that a target is approaching with a 500 knot range rate, the two-second change gears are installed in the sensitivity unit, and that the time delay relay is set at three seconds. Starting at point A (fig. 30), the time constant reduces to 2 seconds at 8,000 yards and then remains fixed. Now suppose that the target reaches the point B and maneuvers radically. The computer operator finds that the solution indicators spin (i.e., the time constant is too large to permit quick rate corrections) ; therefore he presses the sensitivity push button. This makes the system time constant decrease as indicated in figure 30. Since instability would result if such a low time constant were maintained over a long period, the previous value of 2 seconds is restored automatically after a lapse of 3 seconds. This section outlines the operation of Gun Fire Control System Mk 37 (equipped with Radar Equipments Mk 12 and Mk 22) when engaging obscured targets. The term "obscured targets" applies to night attacks and to daytime attacks when the target is initially obscured. Many present-day, and probably a greater proportion of future, air targets come under this classification because, even though attacking by day, they are, when detected, beyond the average range of visibility in prevailing cloud conditions, etc. The operating procedure for engaging obscured air targets when using a system equipped with Radar Equipment Mk 25 is given in section 3.3. Figure 31. Operation of Gun Fire Control System Mk 37 Against Obscured Air Targets. computer is operated in semiautomatic in order to increase the solution time (reduce the computer sensitivity) so that irregularities in the target position data will not affect the computer solution. In semiautomatic operation, the generated and observed bearing and elevation are matched manually instead of automatically, permitting the computer operators to control the computer sensitivity. transmitted to the gun director along with other information such as the number of targets, the possibility of friendly aircraft in the same area, target course, etc. The range, bearing, and elevation designations may be transmitted via synchro indicating systems or by phone concurrently with other information. The following operations should be performed at the gun director during the acquisition of an obscured target. a. Press the slewing key and slew the director until the bearing indicator indicates the designated bearing. a. Turn the pointer's handwheels until the director elevation ring dial of the elevation indicator is matched with the inner target designation pointer. radar equipment being used. A possible method when no designation is available, is to have the trainer train to one end of his sector. The pointer should elevate to about 80 degrees. Then the trainer should train 10 degrees from the end of the sector. The pointer should depress to zero degrees, and so forth until the sector is covered. d. When the target pip is on the horizontal cross line (or the elevation meter needle is not deflected), press the pointer's rate control key. e. If the position angle of the target is below 15 degrees, use the indicator unit (Mk 22) because it will give more accurate data than the Mk 12 equipment at low angles. Turn the pointer's handwheels until the target pip is bisected by the horizontal marker sweep. a. Turn the trainer's handwheels until the director train (or target bearing) ring dial of the train indicator is aligned with the inner target designation pointer. d. When the target pip is on the vertical cross line, press the trainer's rate control key. a. On the range unit, turn the range handcrank until the pointers of the range indicator are matched, then center the designated target pip in the notch of the indicator unit screen. b. If there are several targets on the screen, gate the one at the shortest range. Then check with the assistant control officer to see if it is a "friendly" or a "bogey." If it turns out to be a friendly (i.e., gives the proper IFF response), gate the next shortest range target. Continue this process until the bogies are located. c. Relay any useful information obtained on targets to the target designation center. d. Set the auto switch at ON. e. Hold the rate control switch ON whenever the target pip is in the notch. f. Set the computer aid switch at ON. b. Observe the screen of the identification indicator and inform the control officer whether the target being tracked is a "friendly" or a "bogey." Tracking Gun Director. b. Keep the pointer's rate-control key closed when the above condition exists. a. Turn the trainer's handwheels to keep the target pip aligned with the vertical cross line of the indicator unit. b. Keep the trainer's rate control key closed when the above condition exists. a. Keep the rate control switch at ON when the target pip is gated. Plotting Room. a. Set the control switch at SEMI-AUTO. b. Set the generated bearing and generated elevation cranks at the IN position. c. Slew target angle to the proper quadrant. The proper quadrant may be determined by observing the relative bearing and observed range dials. d. Set the time motor switch at ON. 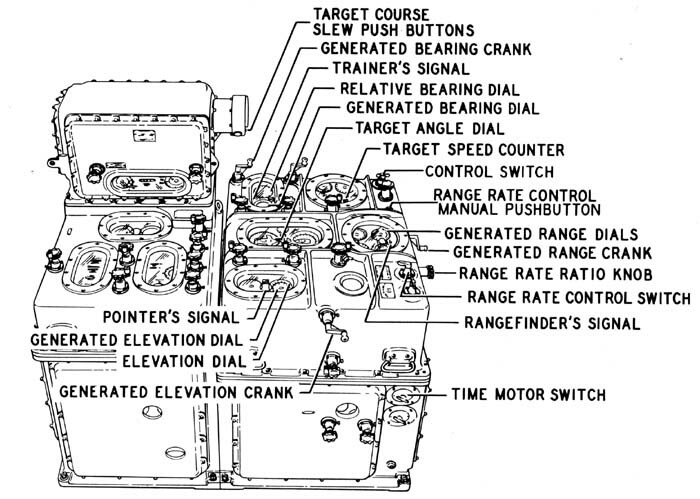 e. By means of the generated bearing crank, make the generated bearing dial turn at the same rate as the relative bearing ring dial whenever the dh-ector trainer's signal indicates that he is "on target." f. By means of the generated elevation crank', make the generated elevation dial turn at the same rate as the elevation ring dial whenever the director pointer's signal indicates that he is "on target." The procedure for firing at obscured targets is identical with that for visible targets except that the slow semiautomatic solution may make it possible to spot. Spotting against a target obscured by darkness is possible when using MTF ammunition by having the control officer spot the bursts in deflection and elevation until they are centered in the pointer's optical telescope. 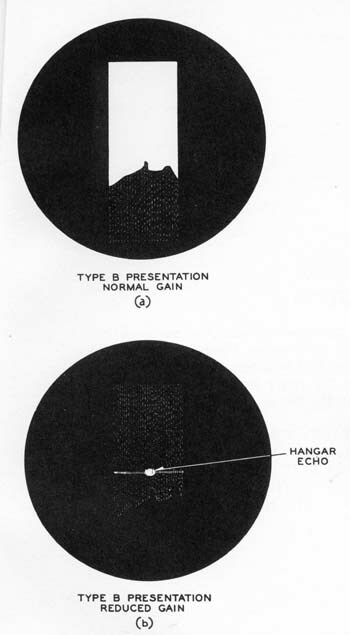 Range spotting is possible if the bursts can be seen on the radar operator's type A presentation (see fig. 40). If during the engagement of an obscured target, the target becomes visible, it is advisable in gun directors equipped with Radar Equipments Mk 12 and Mk 22 for the director pointer and trainer to shift to the more accurate and smoother optical tracking. However, before making the shift, care should be taken to ascertain that the visible target is the target that is being tracked by the radar equipment. Although full automatic is by far the best method of operating a gun fire control system, target position data obtained with Radar Equipments Mk 12 and Mk 22 are not continuous enough to warrant automatic bearing and elevation rate control. In semiautomatic control the target's path is computed by averaging observations over a rather long period. Obviously for a maneuvering target, this procedure is not good. However, with Radar Equipments Mk 12 and Mk 22 it is the best that can be used against obscured air targets. Radar Equipment Mk 25 is an automatic-tracking fire control radar. Since the operation of certain parts of the gun director is different when this equipment is used, this section will describe the differences. Operation of equipments not mentioned in this section is unchanged by the addition of Radar Equipment Mk 25. Except for the target acquisition phase there is no difference between operation of the gun director against visible air targets and operation against obscured air targets; therefore the operating instructions for these types of targets are combined. With Radar Equipment Mk 25 installed, it is possible to operate the gun director with one man, the trainer. This type of operation is described later in this section. When used against obscured targets, the major units of the system function as shown in figure 31, the fire control radar supplying all of the target position data. Figure 32 shows the disposition of the equipments when engaging visible air targets. It is evident from these figures that the only differences in operation exist in the target acquisition phase. a'. If no designations are available, train to one end of the designated sector of coverage. Then have the pointer elevate to 90 degrees, observing the Δ E presentation of the Radar Indicator Mk 22 for the target pip. If no target is located, train 10 degrees from the end of the sector. Then have the pointer depress to zero. Continue this search plan until the pointer locates the target on his Δ E presentation. b. Set the Radar Indicator Mk 22 DISPLAY selector at E. This type of display indicates range horizontally and elevation vertically. a. If under attack, press the BATTLE SHORT push button. This shorts all interlocks and prevents unintentional interruptions. The battle short lamp should light. b. If a range designation is available, match the RANGE dials with the DESIGNATED RANGE dial by means of the RANGE SLEW lever. When the designated range and range dials are matched, the designated range indexes will cross on the vertical marker. Locate the target pip by observing the type A presentation in the vicinity of the range marker. When the target pip is located, put it in the notch of the range sweep by means of the RANGE SLEW lever. b'. If a range designation is not available, search for the target pip on the type A presentation. When it is located, put the target pip in the notch by means of the RANGE SLEW lever. Figure 33. Pointer's and Trainer's Station—Gun Director Mk 37 (Equipped with Radar Equipment Mk 25). Figure 34. 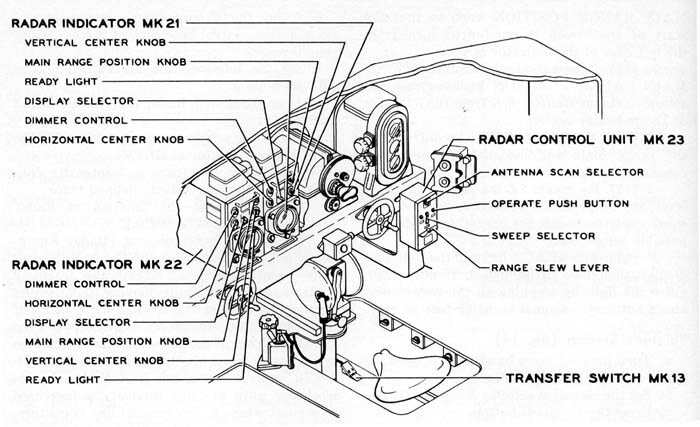 Radar Console Mk 5.
c. Set the SWEEP selector at PRES. This expands the presentation on all indicators permitting more accurate tracking. a. Adjust the FOCUS and INTENSITY controls to give clear, sharply denned sweeps and pips. b. By means of the pointer's handwheels align the target pip with the horizontal index of the Radar Indicator Mk 22 screen. Press the pointer's Transfer Switch Mk 13. The READY or TRACK light on the Radar Indicator Mk 22 screen should light. 'Continue manual tracking until the TRACK light lights. The TRACK light indicates that the automatic tracker has taken control, and the pointer's handwheel need no longer be turned. It also indicates that the pointer's rate control circuit is completed, hence the rate control key need not be closed manually. c. By means of the trainer's handwheels, align the target pip of the type B presentation with the vertical index on the Radar Indicator Mk 21 screen. The type B presentation indicates range vertically and bearing horizontally. Check that the pointer's READY or TRACK light is lit, and then press the trainer's Transfer Switch Mk 13. The READY or TRACK light of the Radar Indicator Mk 21 should light and the antenna should change from spiral to conical scanning. This reduces the scan from 12 to 1.6 degrees. Continue manual tracking until the TRACK light lights. a. Adjust the FOCUS and INTENSITY controls to give a clear, sharply denned pip and sweep. b. By means of the RANGE handwheel, keep the target pip in the notch of the type A presentation sweep. c. Press the radar operator's Transfer Switch Mk 13. The READY or TRACK light of the Radar Indicator Mk 21 should light. Continue manual tracking until the TRACK light lights. The TRACK light indicates that the automatic tracker has taken over and that the range rate control circuit to the computer is completed. d. If the target approaches an area containing radar interference, press the COAST push button until the target passes through the interference. e. If heavy sea return or an interfering ship is present, set the ANTI-JAM selector at the STC, IAGC, or FTC position depending on which gives the clearest presentation. f. To overcome jamming, set the MOD SELECTOR switch at RAN or put it at LOG and turn the REPETITION RATE knob until the jamming is relieved. Set the ANTI-JAM selector at the position which gives the clearest presentation. If jamming is still too great turn the magnetron tuning drive in the Radar Transmitter-Receiver Mk 9 until the jamming is relieved. The gun director may be operated by one man if necessary. This arrangement may be employed under such circumstances as condition 2 or condition 3 watches. The operation of equipments not mentioned in this procedure is unchanged. Before manning the trainer's station, check that the stand-by operations for one-man control outlined in chapter 2 have been performed; i.e., the TRAINER CONTROL switch (fig. 34) is at ON, the OPERATE push button (fig. 33) has been depressed, and the SWEEP selector (fig. 33) is at MAIN. Target acquisition. By means of the trainer's handwheel (fig. 33), train the gun director to the designated bearing. 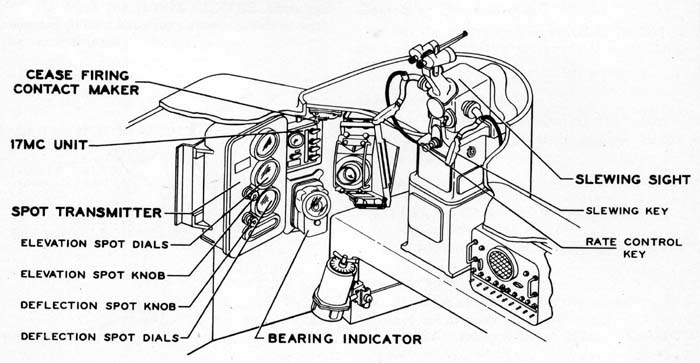 By means of the pointer's handwheels elevate until the target pip is seen on the AE presentation of the Radar Indicator Mk 22. Set the DISPLAY selector of the Radar Indicator Mk 22 at E and turn the pointer's handwheels until the target pip is aligned with the horizontal index on the indicator screen. By means of the RANGE SLEW lever (fig. 33), slew range until the range mark is on the target pip. the RANGE SLEW lever, set the range mark one-sixteenth inch below the target pip on the type B presentation of the Radar Indicator Mk 21. By means of the pointer's and trainer's handwheels, keep the target pips centered on the indicator screens. Continue in this fashion until the TRACK light of the Radar Indicator Mk 21 lights. At the present time, tracking with the automatic tracking Radar Equipment Mk 25 is superior in accuracy and smoothness to any other method of tracking; however, certain conditions may arise which require special attention on the part of the pointer and trainer. Since angular rates of more than 25 degrees per second cannot be attained, with present gun directors, the radar will not stay on targets with angular rates higher than this value. There is also a possibility of the automatic tracking radar locking on a shell burst or a strong nearby surface target. Certain special cases, such as two planes approaching at the same range and elevation and separated by a small amount, may cause the radar equipment to track a point midway between the planes. The above examples suggest that, when possible, the pointer and trainer check on the automatic tracking radar by observing the target through their respective telescopes. Some of the following procedures are outlined to assist in the operation of the Gun Fire Control System Mk 37 in the event of a materiel casualty, while others are merely secondary methods of using the equipments. In the event of a casualty to the radar equipments, optical ranging may be utilized when tracking a visible target. When this is done, the range selector switch (fig. 24) must be set at RANGE FINDER and the range knob on the range finder turned until the target appears to be at the same distance as the range finder reticles. When this condition exists, the range finder's rate control button should be pressed, thereby signalling to the computer that the range is correct. The range rate control switch at the computer (fig. 27) should be set at MANUAL and the generated range crank set at the IN position. With this setup, the computer officer may reduce the computer's sensitivity by ignoring what seems to be an incorrect range and match the pointers of the range dials only when the ranges seem to be consistent. This is done by pressing the range rate-control manual push button and turning the generated range crank until the range dials are matched. The dials should not be matched unless the range finder's signal indicates that he is "on target." Since the proper setting for the range rate ratio (or range time constant) knob varies for different range finder operators, the proper setting must be determined by experimentation. Range spots may be applied by the range finder operator at the range spot transmitter (fig. 24). Certain activities have found that when firing AA common projectiles, dead time and spotting may be controlled more effectively by using salvo fire. To do this, the director pointer's firing contact maker switch on the fuse panel of the fire control switchboard must be set at OFF, and the stable element hand firing contact maker switch set at ON. With this set-up and the gun pointer's firing key closed and locked, all of the guns may be fired from the stable element hand firing key (fig. 44). This key should be closed at regular intervals equal to the maximum expected dead-time. If desired, a salvo signal may be given prior to the salvo by closing the salvo signal key. In the event of a materiel casualty to the gun director drive equipment, the gun director may be operated in local or manual control without interfering with the over-all operation of the system. The elevation selector (fig. 25), or the train selector (fig. 26), or both, may be set at LOCAL or MANUAL. Then the director pointer and trainer keep the target continuously centered in their scopes by turning their respective handwheels. In the event of a casualty to the automatic tracking equipment, indicated by the TRACK light (figs. 33 and 34) flickering or failing to light, the pointer, trainer, or radar operator may track the target munually. When this is done the corresponding rate-control key or push button (figs. 33 and 34)should be closed. There are two ways of employing the Gun Fire Control System Mk 37 against visible surface targets, either of which may be used without appreciable sacrifice of effectiveness. Both methods are described in this chapter, together with their advantages and disadvantages. The choice of method depends on which of the advantages it is desirable to stress in any given situation. Method 1. Figure 35 shows the function of the elements of the Gun Fire Control System Mk 37 when using this method to engage a visible surface target. The over-all operation of the system is almost identical with that used (fig. 21) to engage visible air targets, the only differences being in the operation of the computer. a. Set the fuze hand crank at the IN position. This de-energizes the fuze servo motor and permits fuze setting order to be set as indicated below in (b). 2. 49 seconds for 5"/54, 6"/47, and 8"/55 computers. Figure 35. Operation of Gun Fire Control System Mk 37 Against Visible Surface Targets. Method I. Figure 36. 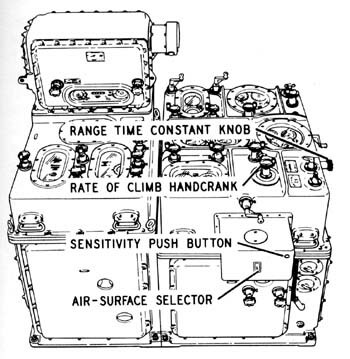 Operating Controls for Surface Fire—Computer Mk I.
c. Set the rate of climb handcrank at the IN (or HAND) position. This engages the hand-crank and, on later models, de-energizes the rate of climb servo motor, permitting manual settings of rate of climb. d. By means of the rate of climb hand-crank, set the rate of climb dial at zero knots, the correct value for surface targets. e. On computers that have not been modified to include the target vector type of rate control (this modification is Ordalt 2331A), use manual rate control. The procedure for manual rate control is given in a subsequent part of this chapter. e'. On computers that have had Ordalt 2331A accomplished, set the AIR-SURFACE selector (fig. 28) at SURFACE, and set the surface time constant control transmitter in accordance with existing instructions (NOTE: Current instruction (Jan. 1949) direct that the time constant control transmitter dial be set at 3.). If shortly after getting "on target," the solution indicators spin, press the sensitivity push button. This quickly corrects any error in the original computer set-up. 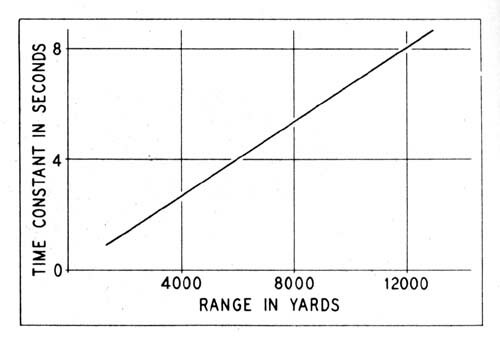 f. 5"/54 computers only—When range is above 20,000 yards, turn the elevation spot knob until the range graduation corresponding to present range is matched with the fixed index for the elevation spot dial. This procedure permits the computer to be used at ranges above the upper limit of advance range. a. Positional errors in the level angle as determined by the stable element do not materially affect the computed gun elevation order. b. The elevation angle in the computer is at its proper value (instead of at zero degrees) thereby allowing a correct solution of the prediction problem. c. No change in the position of the synchronize elevation hand crank is required when shifting to air targets. 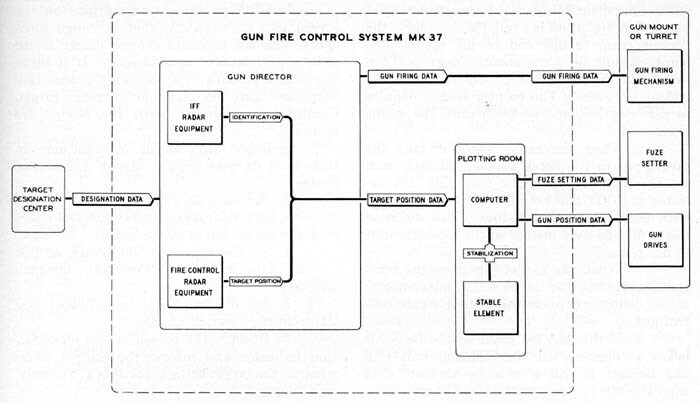 This method utilizes the Gun Fire Control System Mk 37 as shown in figure 37. In this method, elevation data is obtained from the stable element instead of from the gun director. An advantage of this method is that it replaces a human (the director pointer) with a mechanism, thereby reducing the probability of personnel errors, and it usually gives a smaller dispersion in range, which is sometimes desirable. This method MUST be used when the large circle scan of Radar Equipment Mk 25 is being used for spotting purposes because the director pointer must elevate some 5 degrees above the target so that the trainer may get a type B presentation for deflection spotting. If the computer dip dials (fig. 36) are calibrated for the mean trunnion height that exists on the ship, the effectiveness of method 2 is not materially different from the effectiveness of method 1. The procedure for method 2 is identical with method 1 except for the following additional steps at the computer (fig. 36). a. Set the synchronize elevation hand crank at the CENTER position and turn it until the elevation dial is at zero. Then set the synchronize elevation hand crank at the OUT position and match the dip dials with the advance range counter. The recommended procedure for engaging obscured surface targets is the same as method 2 for visible surface targets except that the target should be tracked as outlined in section 3.2 (sec. 3.3 if Radar Equipment Mk 25 is installed). Accurate range and deflection spots for either visible or obscured surface targets may be obtained from Radar Equipment Mk 25 by utilizing it as outlined in this section. These operations are in addition to those previously outlined in section 3.3 for target acquisition and tracking. Method 2 for engaging surface targets must be employed with this procedure because the director pointer does not stay "on target." Figure 37. Operation of Gun Fire Control System Mlt 37 Against Visible Surface Targets. Method 2. Figure 38. 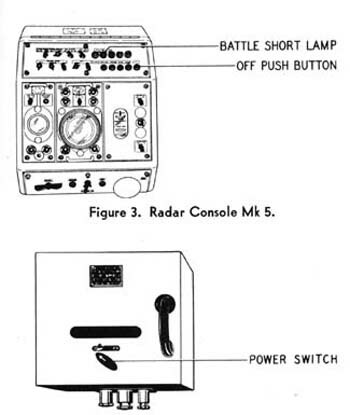 Radar Console Mk 5.
a. Set the GAIN selector at MAN. This permits manual control of the receiver gain. b. Set the MANUAL gain control knob at its clockwise limit. This gives the maximum gain which is necessary for observing shell splashes. a. 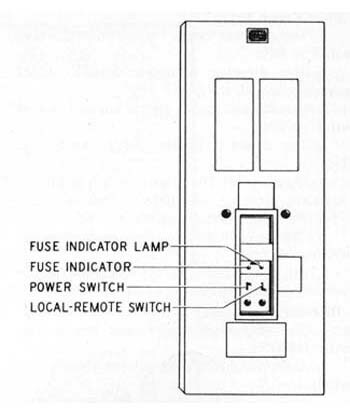 Press the pointer's and trainer's Transfer Switches Mk 13 (fig. 33). The TRACK lights and READY lights of the Radar Indicators Mk 21 and Mk 22 should go out, indicating that automatic tracking has ceased. b. Set the antenna scan selector (fig. 15) at CIRCLE. This makes the antenna scan approximately a 2-degree annular ring with a mean diameter of 10 degrees. c. Manually track the target in train by turning the trainer's handwheel to keep the target pip aligned with the vertical index in the type B presentation of the Radar Indicator Mk 21. Keep the trainer's rate control key (fig. 33) closed when "on target." Figure 39. Typical Splash Indications. Figure 40. Splash Indication of a Six Gun Salvo. 5 degrees so that the lower part of the circle-scan annular ring intersects the target. Do not close the pointer's rate control key. a. 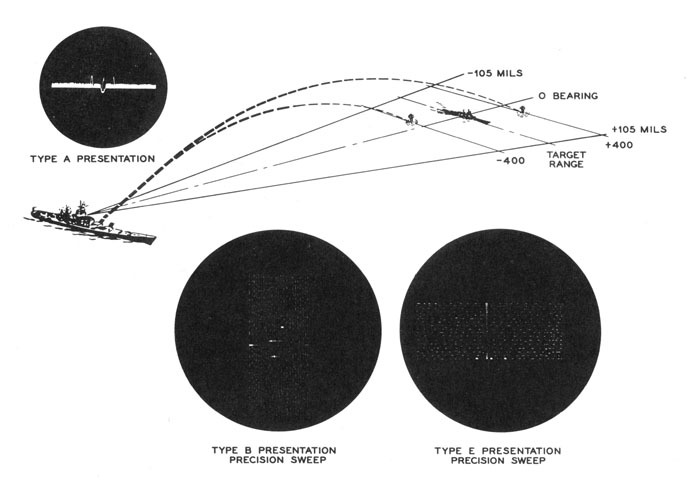 Obtain the required deflection spot by estimating the distance between the splash (or mean splash of a salvo and the target on the type B presentation of the Radar Indicator Mk 21 (fig. 20). a. Obtain the required range spot by estimating the distance between the splash (or mean splash of a salvo) and the target on the type A presentation (fig. 34) of the Radar Indicator Mk 20.
b. Apply the spot obtained in (a) by means of the range spot knob of the Range Spot Transmitter (fig. 24). sides of the target. Since it is known that on precision (PRES) sweep, the range sweep is 4,000 yards long, the distance between the splashes and the target may be easily estimated. In this case, the splash on the left represents a "short" of 400 yards and would require an ADD spot of 400 yards, while the splash on the right would require a DROP spot of 400 yards. The type B and type E presentations corresponding to the problem in figure 39 are shown at the bottom of the figure. The type B presentation indicates that the short splash would require a RIGHT deflection spot, while the long range splash would require a LEFT deflection spot. The magnitude of the required deflection spot may be estimated if it is remembered that, when using circle scan, the field of coverage is 12 degrees wide; hence a splash pip half way between the target pip and the left edge of the type B scan would require a 3-degree or approximately 50 mils RIGHT deflection spot. Thus it can be seen from the type B presentation in figure 39, that the short splash requires a RIGHT deflection spot of approximately 20 mils while the long range splash requires a LEFT deflection spot of approximately 20 mils. The types A, B, and E presentations showing the splashes of a typical 6-gun salvo are shown in figure 40. Since the mean point of impact (M.P.I.) should be spotted to the target, good spots for this situation would be ADD 300 yards and RIGHT 30 mils. Since effective spotting is possible against surface targets, it is important that the gun fire control system have a stable solution so that there will be little dispersion between successive salvos. If the system time constant were left the same as for air targets (fig. 29), each small perturbation in director train would cause a change in the target setup at the counter. This in turn would cause the gun mounts (or turrets) to move, resulting in an unpredictable pattern that would be impossible to spot. For this reason, the system time constant is increased for surface firing. This is accomplished in either of two ways, depending on whether or not Ordalt 2331A has been accomplished. If Ordalt 2331A has not been accomplished, the system time constant is increased by resorting to manual rate control. The procedure for this type of operation is given later in this chapter. If Ordalt 2331A has been accomplished, the time constant is increased by setting the AIR-SURFACE selector (figure 28) at SURFACE. This makes the solution time constant KR/R'X 1000 seconds, where K represents the time constant change gears in seconds, R is the present range in yards, and R' is the setting of the time constant control transmitter. Since this value becomes rather large at long range (fig. 41), provisions are made to reduce the time constant if necessary. When the sensitivity push button (fig. 28) is pressed, the time constant is reduced to approximately 72/4000 seconds. If the time constant stayed at this value, the system would be too sensitive for surface fire; therefore, after a given delay (2 or 3 seconds), the time constant automatically returns to its previous value which is suitable for tracking and spotting most surface targets. In certain instances, manual rate control is desirable when a surface target is being engaged. Probably the most desirable advantage is that it permits the computer operator to increase the system time constant; thereby giving a stable solution which results in the low dispersion that, for spotting purposes, is desirable in surface firing. Figure 42. Manual Rate Control—Computer Mk I.
tor at HAND. This de-energizes the target angle servo and permits manual setting of target angle. b. Set the target speed handcrank selector at HAND. This de-energizes the target speed servo and permits manual settings of target speed. c. Set the control switch at SEMI-AUTO. This, among other things, prevents the director pointer and trainer from rate controlling. d. Set the range rate-control switch at MANUAL. e. By means of the generated range crank match the generated range dials with the observed range dials. f. Adjust the target speed hand crank and target angle hand crank so that the generated range and generated bearing dials move at the same rate as the observed range and relative bearing dials. The illumination of surface targets may be accomplished either by star shells or by searchlights. The Gun Fire Control System Mk 37 may be used to direct both of these illuminating devices. The procedures given here are in addition to those given for directing destructive fire against a surface target. Figure 43. Assistant Control Officer's Station—Gun Director Mk 37.
order switches of the star shell mounts at STAR SHELL. b. At the gun mount, shift all gun drives into AUTO. If it is desired to fire a star shell search spread, set the parallax selector at the gun train drive at MANUAL and match the proper graduation on the inner parallax pointer with the fixed index. c. At the computer (fig. 36), match the inner and outer star shell range dials with the star shell range counter. Keep the star shell range spot dial matched with the pointer. d. At the gun director, notify the star shell mounts to load hoists with star shells. a. At the gun director assistant control officer's station (fig. 43) set the searchlight control handle at ON-CLOSE. b. At the searchlights, set the train and elevation selectors at AUTO. Check that the shutters are closed, and strike arcs. to reduce the motion of the guns or the gun director. This may be accomplished by resorting to selected level or selected cross-level firing. A predetermined value of either level or cross-level may be selected at the stable element as follows: a. At the fuze panel of the fire control switchboard, set the director pointer's firing contact maker switch at OFF and the stable element automatic firing contact maker at ON. b. At the computer (fig. 36), set the synchronize elevation handcrank at the CENTER position and set the elevation dial at zero. Then set the handcrank at the OUT position and match the dip dials with the advance range counter. c. At the stable element (fig. 44), set the firing selector switch at LEVEL FIRE or CROSS-LEVEL FIRE, depending on which quantity is to be selected. d. By means of the proper hand input crank, set the level or cross-level dial at its selected value. e. Close the automatic firing key. The guns will then fire when the actual value of level or cross level is equal to the selected value. Level may also be selected at the gun director. This may be done as follows: a. At the computer (fig. 36), set the synchronize elevation hand crank at the CENTER position and set the elevation dial at zero. b. At the gun director, set the elevation selector lever (fig. 25) at LOCAL. Turn the pointer's handwheels (fig. 25) until the elevation indicator is at the desired value of level. c. Close the pointer's firing key when the horizontal cross hair of the pointer's telescope crosses the target. c. At the gun director assistant control officer's station (fig. 43), set the searchlight control handle at ON-OPEN. By means of the elevation and deflection offset knobs, apply spots as required. Figure 44. Stable Element Mk 6. &nbspa. At the fuze panel of the fire control switchboard, set the director pointer's firing contact maker switch at OFF and the stable element automatic firing contact maker at ON. &nbspb. At the computer (fig. 36), set the synchronize elevation handcrank at the CENTER position and set the elevation dial at zero. Then set the handcrank at the OUT position and match the dip dials with the advance range counter. &nbspc. At the stable element (fig. 44), set the firing selector switch at LEVEL FIRE or CROSS-LEVEL FIRE, depending on which quantity is to be selected. &nbspd. By means of the proper hand input crank, set the level or cross-level dial at its selected value. &nbspe. Close the automatic firing key. The guns will then fire when the actual value of level or cross level is equal to the selected value. &nbspa. At the computer (fig. 36), set the synchronize elevation hand crank at the CENTER position and set the elevation dial at zero. b. At the gun director, set the elevation selector lever (fig. 25) at LOCAL. Turn the pointer's handwheels (fig. 25) until the elevation indicator is at the desired value of level. &nbspc. Close the pointer's firing key when the horizontal cross hair of the pointer's telescope crosses the target. Figure 45. Operation of Gun Fire Control System Mk 37—Indirect Fire. Figure 46. 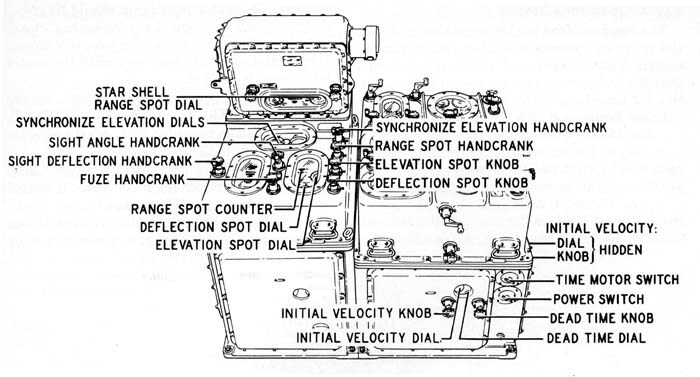 Operation of Gun Fire Control System Mk 37—Offset Fire—Method I (Point "Oboe" Method). Whenever possible, direct fire should be used against shore targets. 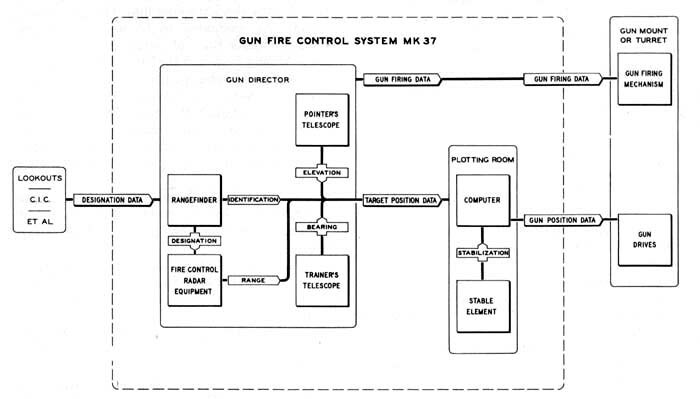 When this is done, the procedure for operating the Gun Fire Control System Mk 37 is essentially the same as for firing against surface targets, except that it is usually necessary to use optical tracking in train, elevation, and range. Unfortunately, due to conditions that accompany a shore bombardment, direct tracking is not always possible; hence indirect fire or offset fire must be employed. 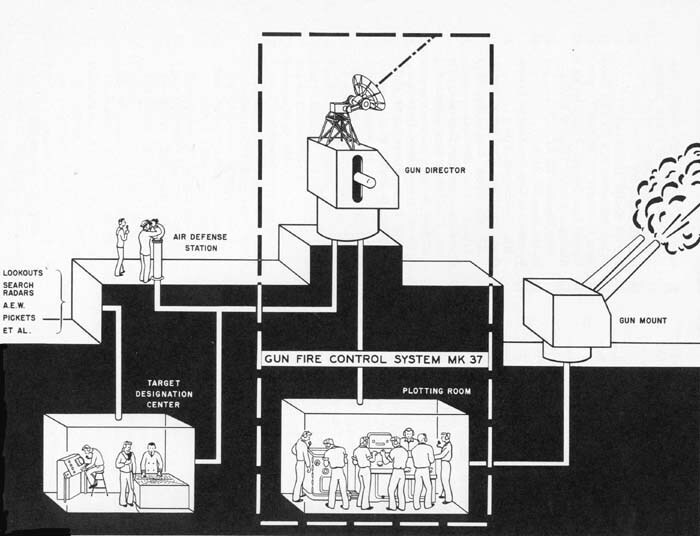 In instances where the target is obscured, the Gun Fire Control System Mk 37 may be used to direct destructive fire as shown in figure 45. In this method the point that is tracked by the computer is always the desired point of fall. A chart, which includes the ship and target positions, is used to determine the target position with respect to the ship. As this method requires an accurate plot of the firing ship's position on a chart that includes the target area, and the gun director is not required for other operations, the gun director can be used to determine the ship's position with respect to the shore by taking ranges and bearings to known points. The following paragraphs outline the operations required to shift the Gun Fire Control System Mk 37 from the stand-by condition to the setup for indirect fire. At the computer (fig. 36) set the control switch at LOCAL, and the target speed hand crank selector at HAND. By means of the target speed hand crank, set the target speed counter at zero. (NOTE: Since the pitometer log merely indicates the speed of the firing ship through the water, some activities have found it desirable to set the computer target speed counter at the speed of the current at the ship's location and to set target course at the course of the current plus 180 degrees. This counteracts the effect of the motion of the water and allows the computer to generate correctly.) Set the synchronize elevation handcrank at the CENTER position. Set the elevation dial at zero. Then set the synchronize elevation handcrank at the OUT position and match the dip dials with the advance range counter. Turn the generated bearing and generated range cranks until the true bearing and generated range dials agree with the values indicated by the chart. If firing at an elevated target, make the appropriate setting on the elevation spot dial. Set the time motor switch at ON. Commence firing. 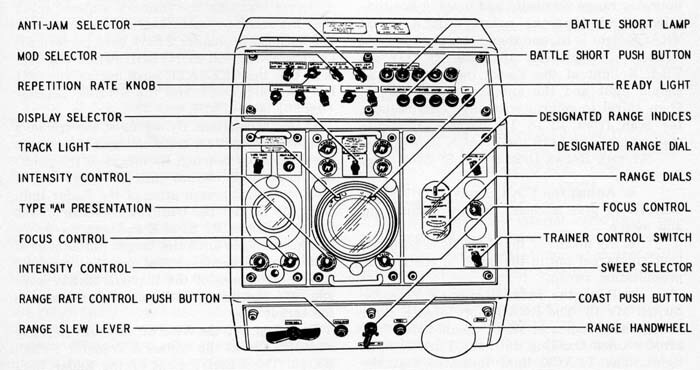 Spots received from the shore fire control party or aircraft should be applied by means of the range and deflection spot knobs (fig. 11). Offset fire, which is indirect fire with a point of aim, may be employed to advantage by the Gun Fire Control System Mk 37 when engaging targets with a known relationship to a good optical or radar point of aim. Although offset fire in most instances is not considered as effective as full indirect fire for engaging obscured land targets, it has to its credit the advantage of a reference point for checking the computer solution and the fact that in emergencies, offset firing may be conducted without the use of previously prepared charts of the area to be bombarded. In general, offset firing with the Gun Fire Control System Mk 37 can be done in two ways. 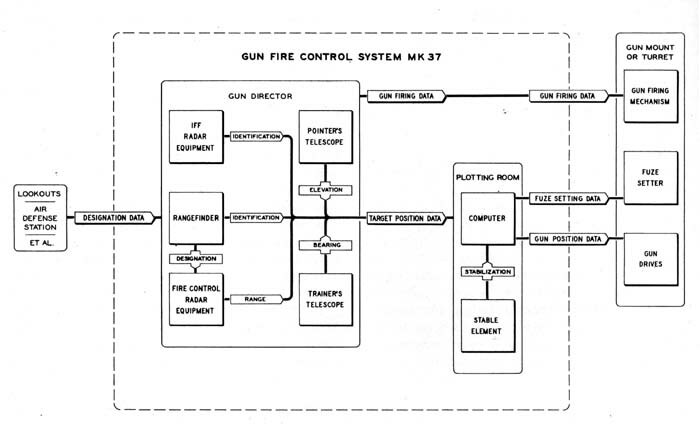 The operation of Gun Fire Control System Mk 37 during offset fire—Method 1 (called the "Point Oboe Method" by several fleet activities) is indicated in figure 46. Here the gun director tracks the offset reference point and the computer solves the problem using the point of aim as a target. Figure 47. 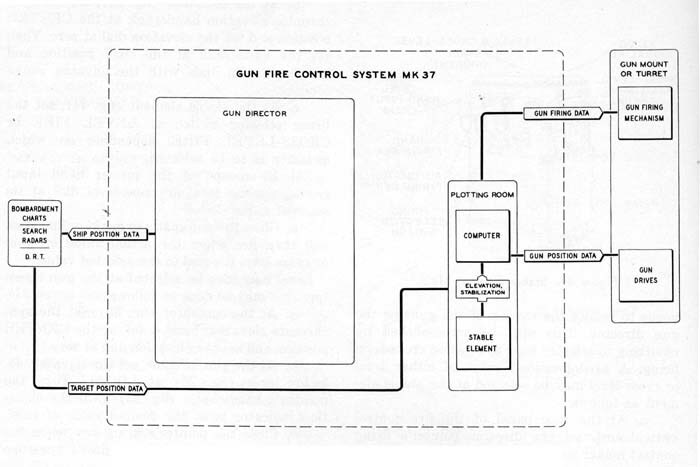 Operation of Gun Fire Control System Mk 37—Offset Fire—Method 2 (Offset Method). shifted from the point of aim to the target by means of the range and deflection spot knobs (fig. 11). This method is limited by the size of the permissible deflection spots to targets within 10 degrees of the point of aim. Consideration of the problem also discloses the fact that, for a moving ship, the required range and deflection spots are continuously changing due to changes in the relative bearing of the point of aim; hence, the spots must be computed and set into the computer continuously. Method 2. The above-mentioned disadvantages of the form of offset fire described under under "Method 1" are eliminated in Method 2 (This method is sometimes called "Offset method"). 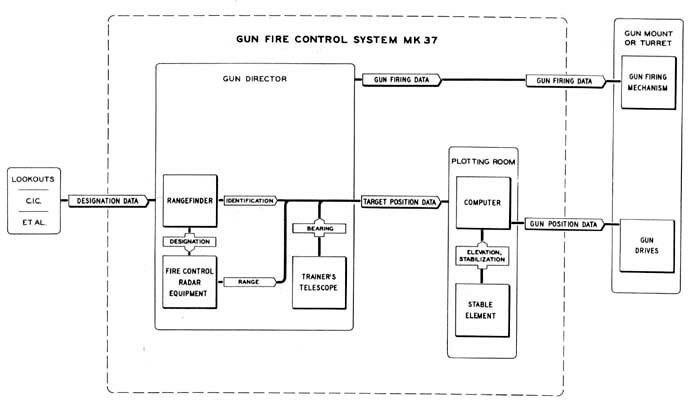 The operation of the Gun Fire Control System Mk 37 when Method 2 is employed is indicated in figure 47. Here, as in the case of Method 1, the gun director tracks the point of aim. However, offsets are applied to the data furnished to the generating section of the computer so that bearing and range are generated for the point of fall (i.e., the target) rather than the point of aim. This is accomplished by operating the computer in LOCAL control and inserting range and bearing offsets by means of the generated range and generated bearing cranks. 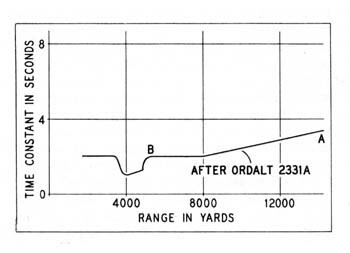 To aid in inserting bearing offsets by means of the generated bearing crank, Ordalt 2127 provides for a scale to be attached to the generated bearing crank. The remainder of the problem is handled in the same manner as that previously descripbed under "Indirect fire." THERE ARE MANY TASKS WHICH ACCOMPANY A SHORE BOMBARDMENT, SUCH AS THE PREPARATION OF CHARTS, EXPECTED RADAR INDICATIONS, COMMUNICATION PROBLEMS, SELECTING PROJECTILES AND POWDER CHARGES, ETC., WHICH THIS PAMPHLET DOES NOT ATTEMPT TO DESCRIBE. Figure 48. A Shore Bombardment Problem. Figure 49. 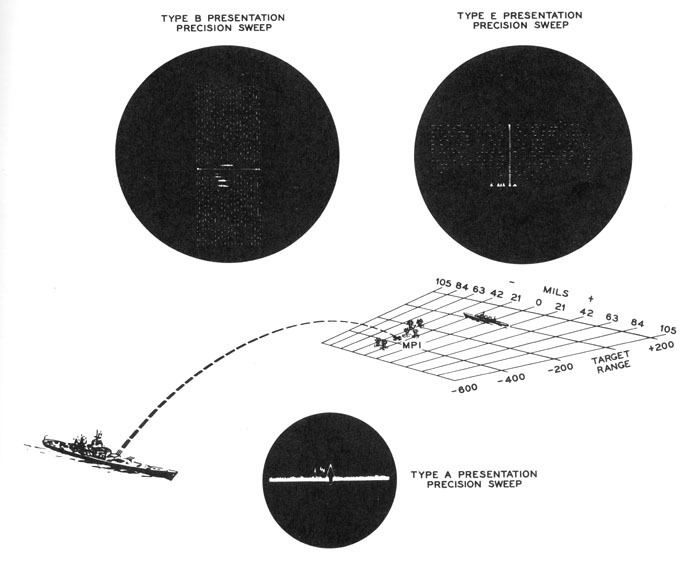 Type B Radar Presentations of the Problem in Figure 48. Naturally, if all of these targets were visible (or good radar targets), direct fire, similar to that outlined for engaging surface targets, would be in order. 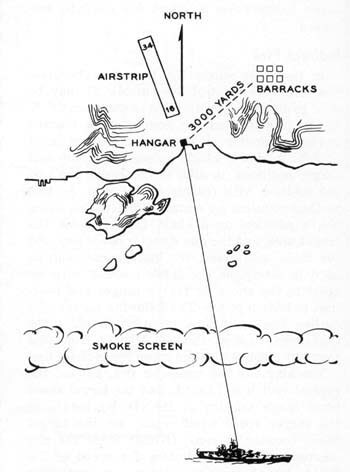 In this case, however, a smoke screen obscures the entire island and the only good radar target is the hangar. Figure 49 (a) shows a type B presentation (Radar Indicator Mk 21) of this problem with normal (AGC) receiver gain. Since the metal hangar is known to be a good radar reflector, it may be located by setting the GAIN selector (fig. 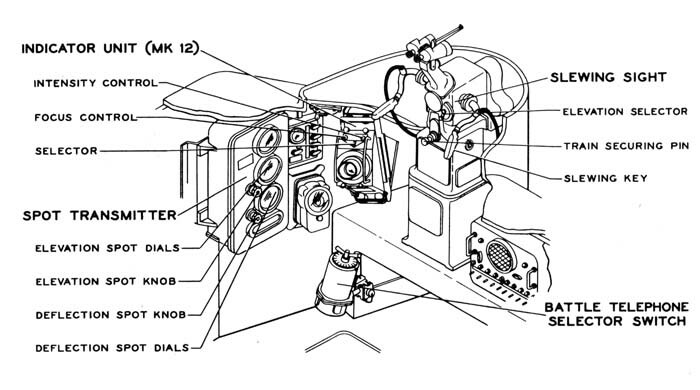 38) of the Radar Console Mk 5 at MAN and then adjusting the MANUAL gain control knob so that the surrounding land disappears, leaving only the hangar (fig. 49 (b)) as a point of aim. Offset Fire—Method 1 may be used to destroy the barracks by using the hangar as a point of aim and obtaining the required range and deflection spots from a chart. The hangar and airstrip may be destroyed by a rather unique method as follows. The system is set up as usual for direct fire, and destructive fire is started against the hangar. Since it is known that the airstrip lies in a direction 340 degrees from the hangar, the target course dial of the target course indicator (fig. 36) should be set at 340 degrees and the target speed counter at 15 knots. Then the computer time motor switch should be set at ON. With the computer control switch at LOCAL and the Range Rate Control Switch (fig. 27) at MANUAL, this procedure will cause the points of impact of the projectiles to creep down the airstrip. If a projectile is fired every 4 seconds, the hits should be linearly dispersed about every 100 feet on the airstrip.